At left, a dedication page "To the great Variety of Readers" is shown from a facsimile of William Shakespeare's First Folio from 1866. 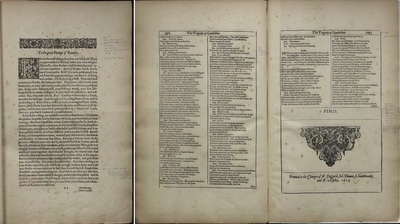 At right, two pages of 'Cymbeline' from the same facsimile (note the backwards page number at far right). One of the SUNY Buffalo State First Folio facsimile marginaliast’s favorite theories is repeated on the pages shown here: typographic errors. On the Dedication page, the marginaliast notes that the illustration at the top of the page is upside down and, in “Cymbeline,” the marginaliast points out an erroneous page number. Such small mistakes were favored by Baconians as secret messages from Bacon that proved his authorship of Shakespeare’s plays, but they actually revealed how little the marginaliast (and Baconians more generally) knew about the publishing history of the First Folio and its later facsimiles. The Baconian idea that typographic errors were placed there by Francis Bacon himself is fundamentally flawed in that Bacon was not involved in the publication of the First Folio in 1623. While Bacon was still alive when the First Folio was originally published, the Folio itself was compiled solely by two of William Shakespeare’s colleagues, John Heminges and Henry Condell – not by Bacon. Further, since its publication, the First Folio has been known for typographic errors within its text. These errors were the result of a printing process reliant upon printing staff (called compositors) with varying skill levels translating messy manuscripts into print. At least five compositors are known to have worked on the First Folio, one of whom was a mostly-untrained apprentice, so the introduction of irregularities and outright errors was to be expected. In the 1860s, when Howard Staunton was preparing his photographic facsimile for Day & Son, he was tremendously frustrated with the existing typos in the First Folio and had a hard time allowing them in his photographic reproduction of the book. After publication, Staunton’s facsimile was initially praised as “a miracle of accuracy,” but was later accused of introducing errors into the text due to his manipulation of photographic plates and the low quality of photographic reproduction available at the time. Thus, the marginaliast was using typographic errors variously introduced by anyone from untrained printing staff in the 1620s to a photographer in the nineteenth century as vital parts of his or her Baconian argument. As cryptographers William and Elizebeth Friedman noted, any such errors-as-messages “could have been inserted by the printer himself, playing an elaborate hoax on posterity.” The errors are in any event very removed from Francis Bacon’s potential involvement as author of the plays, devaluing the Baconian argument considerably and revealing how little the marginaliast knew about the First Folio’s printing history. Charlton Hinman, “The Prentice Hand in the Tragedies of the Shakespeare First Folio: Compositor E,” Studies in Bibliography Vol. 9 (1957), 4. William F. and Elizebeth S. Friedman, The Shakespearean Ciphers Examined: An Analysis of Cryptographic Systems Used as Evidence That Some Author Other Than William Shakespeare Wrote the Plays Commonly Attributed to Him (Cambridge: Cambridge University Press, 1957), 92.